Molly McGee the Sweetest Rottie You Ever Have Seen! 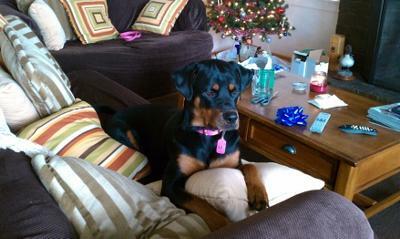 My sweet precious Rottweiler Molly is 1.5 years old and the sweetest, most playful and loving Rottie you will ever meet. My fiance and I rescued her Sept 2010 and she is the light of our lives! Since then she has made countless friends, she had an unbelievable christmas vacation in Carmel "by the Sea" CA (the most dog friendly place in the country) and played for days and days on the beach! Since then she has learned to sit, shake and rollover!!!! Yay!!! She loves to snuggle and always sleep on her back!! Everywhere we go even into department stores and pet stores she is always asked for, so she travels everywhere with us and we are so proud of our baby girl! She is my sweet beautiful baby and I love her so very much!!! We are all so blessed to have found each other! 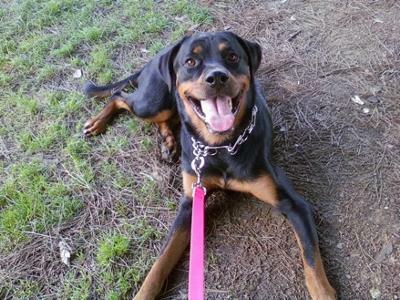 Comments for Molly McGee the Sweetest Rottie You Ever Have Seen! 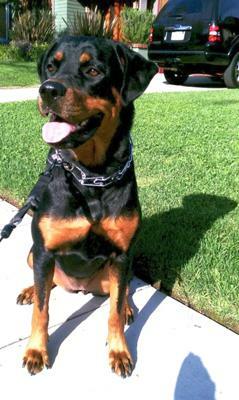 Although your dog looks awesome, my boy Gus is truly the sweetest rott ever. Awww Molly is one beautiful girl, I love her smile. Thanks for sharing her story and pictures.